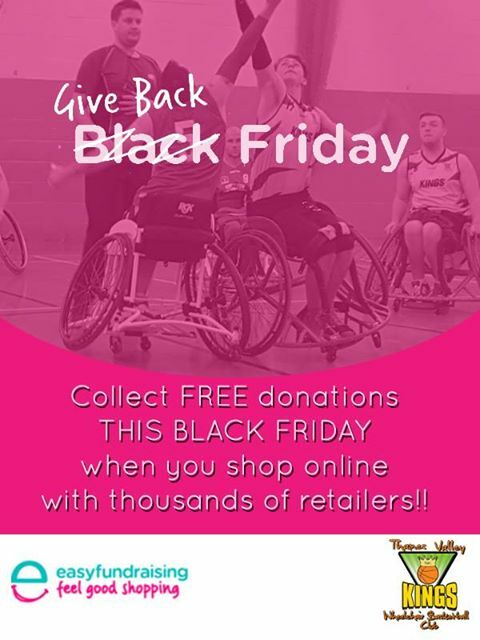 Thames Valley Kings Wheelchair Basketball Website - LATEST NEWS - Black Friday is here! Black Friday is here and this year it's bigger and better than ever! Don't forget to use easyfundraising to collect free donations as you bag bargains to help the Thames Valley Kings - There's absolutely no Catch, It's free, easy and makes you feel all warm inside knowing that your new awesome purchases are helping us deliver Wheelchair Basketball to our awesome Members. July 10 2017 - Kings will making an appearance on That's TV Thames Valley this evening! A tough day at the office for the Division 3 team as they fight hard against CWBA3 but it Coventry that pick up the win Lots to learn from this one! Kings Div3 Team are on the road this Sunday in Division Three South West! It promises yet another tough yet competitive matchup for this team! The #KingsArmy is calling you!